This large adult salamander crawled under the crack of the front door of a house on a rainy night in January. with expanded tips that help them climb vertical surfaces like tree trunks and cliffs. Two adult males locked in bloody combat in Santa Cruz County © Sasha Robinson. The picture on the far right was taken about an hour after the first two pictures and they were still fighting. Be careful when handling this salamander! It has lots of sharp teeth and isn't afraid to use them. This adult from Santa Clara County has a mottled head. © Katherine Hughes Top: Typical Arboreal Salamander. Bottom: Albino or pigmentless adult Arboreal Salamander. Both were found in the same general location in Contra Costa County. 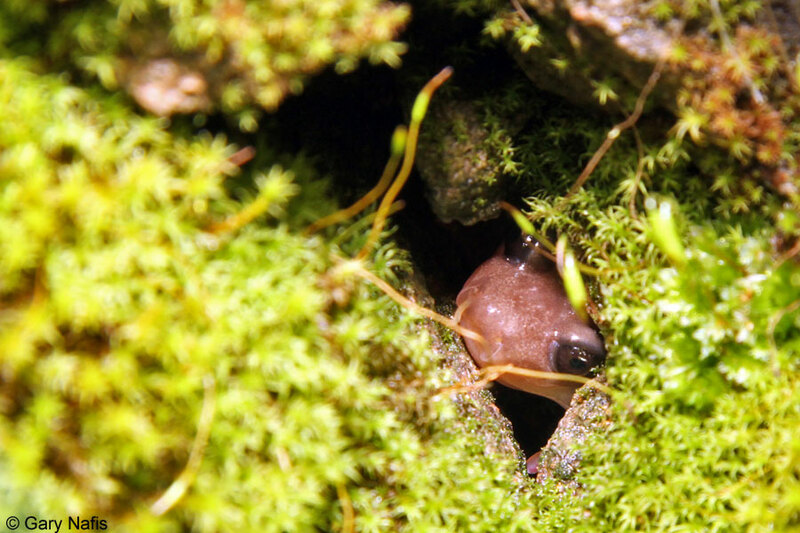 During the dry period, usually from May or June to October or November, Arboreal Salamanders hide out in cool moist areas, usually underground, sometimes in tree hollows, sometimes in basements and underground garages. Eric Boyer discovered this large group of in situ estivating adult and juvenile Arboreal salamanders underneath some wood while remodeling a backyard in Santa Barbara County in June. 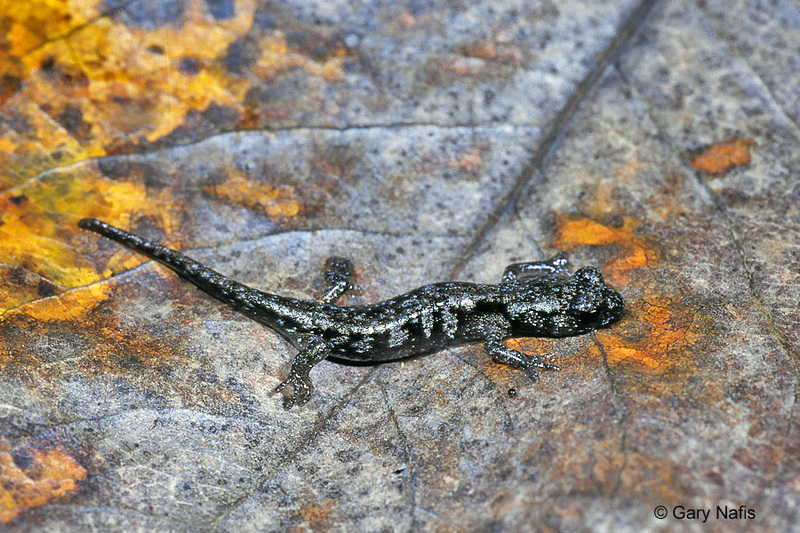 © Eric Boyer This in situ Arboreal Salamander was found underneath the circular base of a large statue in a Santa Clara County backyard in August. © Laurie Weber Female Arboreal Salamanders lay their eggs in a moist place in late Spring or early Summer, and typically remain with the eggs until they hatch in August and September, shortly before the onset of the Fall rains which allow them to come out of hiding. These eggs were found with several aestivating Arboreal Salamanders in late July under some old redwood planks in a shaded area next to a house in Sonoma County. rocky Año Nuevo Island. A careful look underneath the fallen branches and bark of the dead tree shown above on a wet winter afternoon turned up 16 salamanders of 4 species - one Arboreal Salamander, two Coast Range Newts, one Yellow-eyed Ensatina, and 12 California Slender Salamanders, proving that wood debris on a forest floor is an important microhabitat for salamanders. 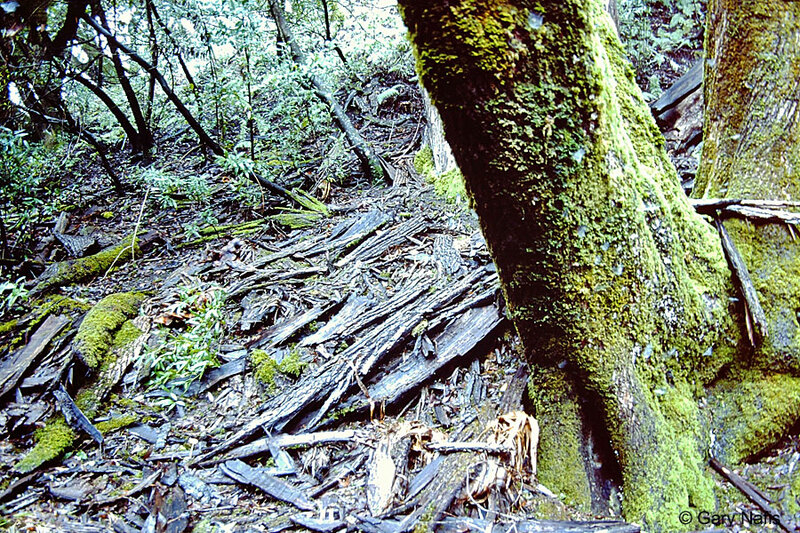 Along with fallen debris, tree bark, tree cavities, root holes, and splits in trees are also useful habitat for many kinds of wildlife, including birds, mammals, amphibians and reptiles, but dead trees and their debris are often removed indiscriminately without consideration for wildlife. resting and running. 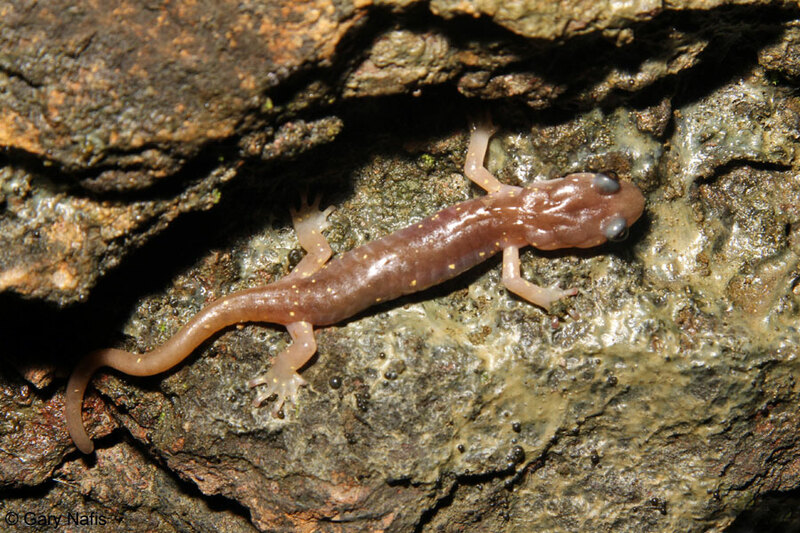 Several Arboreal Salamanders are seen hiding in cracks in a rock wall at night. A large one out on the rocks crawls back into a hiding spot. 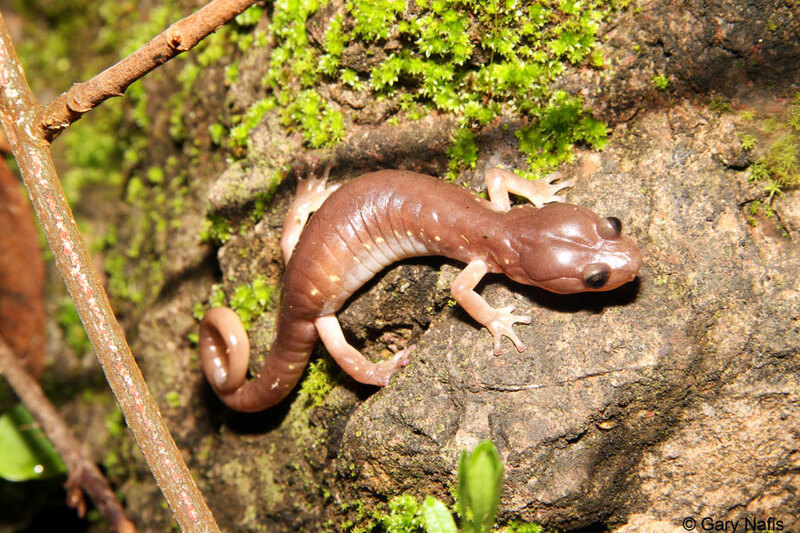 Listen to this sub-adult Marin County Arboreal Salamander squeak two times. (There's a faint high-pitched squeak, then some rustling background noise, then another faint squeak.) 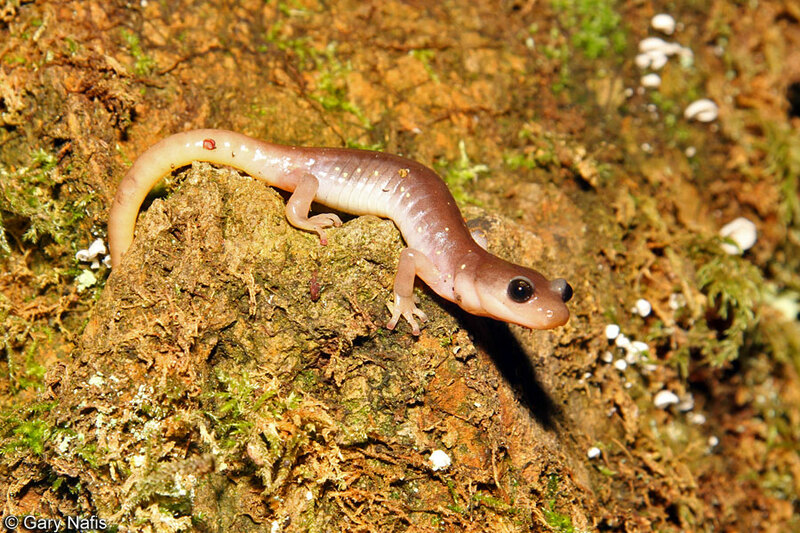 The salamander squeaked several times when the log under which it was resting was lifted. 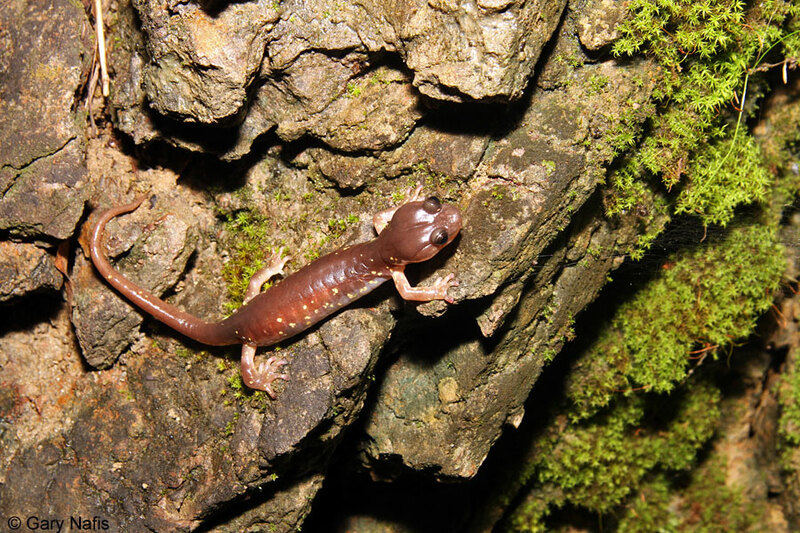 Sound and photo © Jonathan Hakim An Arboreal Salamander, found sitting out on a rock at night, chirps when I grasp it across the sides firmly with my thumb and one finger. The salamander was not squeezed so hard that the sound was just the sound of air being pushed out of its lungs. This species is capable of making a fairly loud sound, but this one was very quiet, so there is a lot of background noise from a flowing creek nearby. Adults measure 2 1/4 - 4 inches long (5.7 - 10.1 cm) from snout to vent and up to 7 inches (18 cm) in total length. The largest species of Aneides. A medium sized lungless salamander. Toe tips are expanded and squarish. Tail is prehensile, often coiled. Color is brown above with small cream to yellow spots. The number and size of the spots varies with location - Most Sierra Nevada and North Coast populations have weak spotting, while Gabilan Mountains and Southeast Farallon Island populations have large conspicuous spots. Other areas have populations with small spots and populations with intermediate spots. The venter is creamy white. The undersides of the tail and feet are dull yellow. Young are dark, clouded with gray or brassy color. 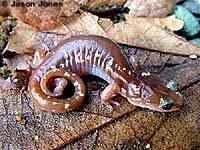 Active when soil moisture is high after the onset of fall rains, usually in November, to May, but relatively tolerant of dry conditions compared to many other salamander species. Strong jaws and sharp teeth are capable of producing a painful bite. Adapted for climbing with long toes and rounded tail. Has been found up to 59 ft. (18 m) above the ground. Both males and females are agressively territorial. 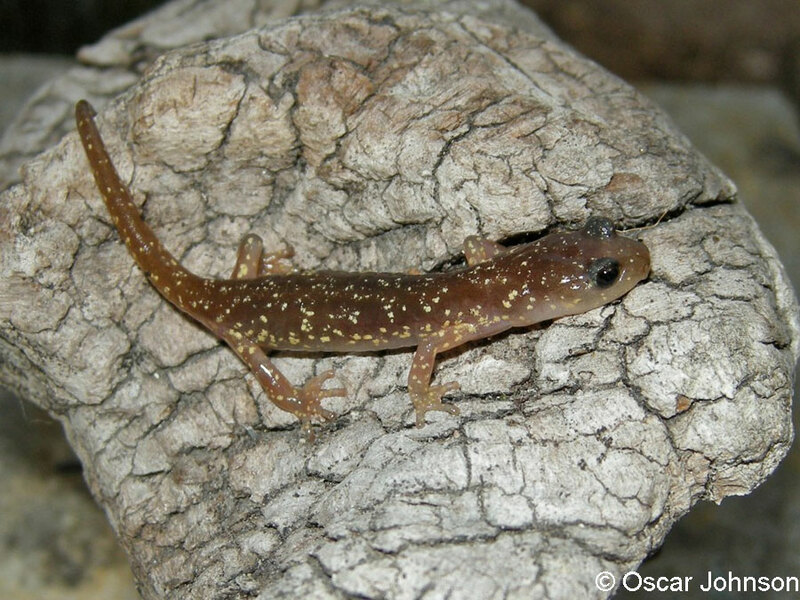 Individuals covered with scars (probably from fighting) are often found, and captives kept together often bite the other salamander's tail. Since the species is often found sheltering together in large numbers in dry weather, it appears that territorial agression is not constant. Anti-predator behaviors include biting, a raised defensive posture, making a squeaking sound, fleeing rapidly, and jumping. 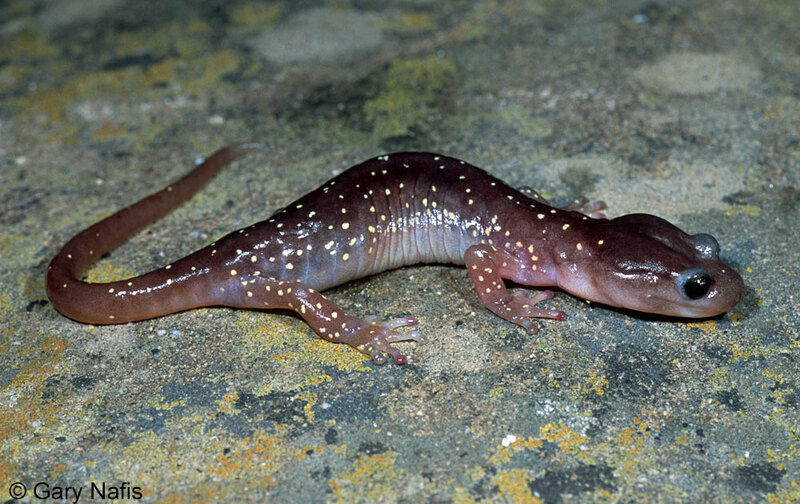 This salamander may squeak when it is picked up or disturbed. 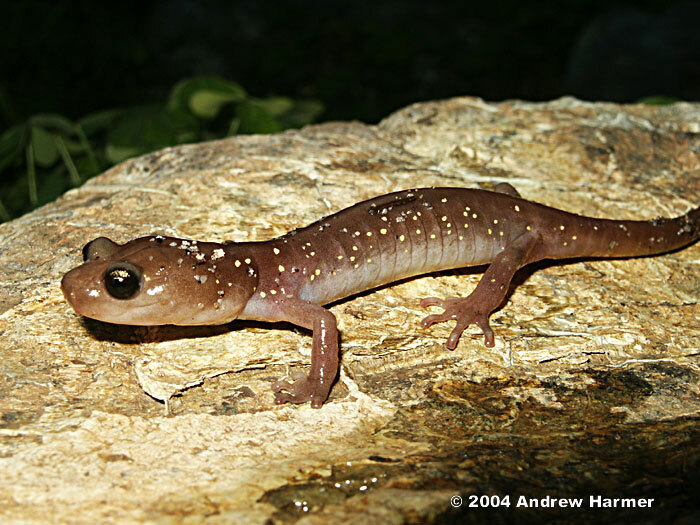 According to Stebbins and Cohen, 1997, an Arboreal Salamander "...may squeak repeatedly when caught, retracting its eyes into their sockets each time a sound is produced, When the eyeballs are depressed, their undersides protrude into the mouth cavity, thereby compressing the air in the mouth and forcing it outward. It is this movement that appears somehow to cause the sounds produced." Eats a variety of small invertebrates including millipedes, worms, snails, ants, termites, sowbugs, moths, and centipedes. Prey is captured by the tongue and brought into the mouth where it is crushed. 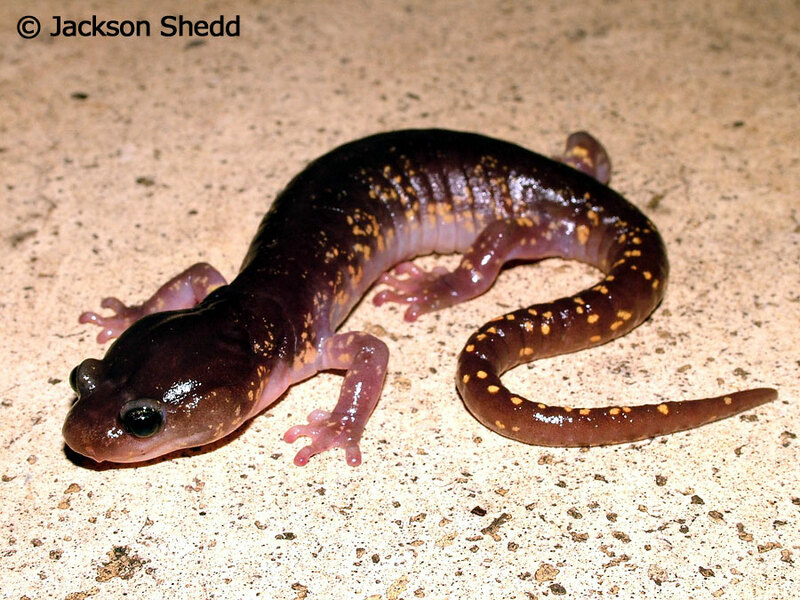 A sit-and-wait-predator, adults forage for small invertebrates and sometimes slender salamanders on the ground at night during wet weather. Adults probably reach sexual maturity in their third year. I have not yet found any documentation that describes the time of year when this species breeds. Breeding males have a heart-shaped mental gland under their chin. Males put this gland on a female's back, stroking her back quickly with it during courtship while scratching her skin with his teeth to deliver the mental gland pheromones to the female. In late spring and early summer, females lay from 5 - 24 eggs in moist places, most commonly in decaying cavities of live oak trees, sometimes high off the ground, and also under rocks and other surface objects and inside logs. Females usually remain with the eggs until they hatch, often coiled around them. Sometimes the eggs of several salamanders are found together in large masses. Males have also been found with females at the egg deposition site and adults and juveniles may stay together after hatching, perhaps waiting for the onset of the fall rains which will allow them to disperse from their refuge. They may stay with the male and female for a time after hatching. Lives in moist places on land, mostly in coastal oak woodlands, but also found in yellow pine and black oak forests in the Sierra Nevada and other dryer habitats, including coastal sand dunes. Also found on moist, mossy rock faces, under rocks and woody debris on land, inside stumps, and in urban yards and buildings. 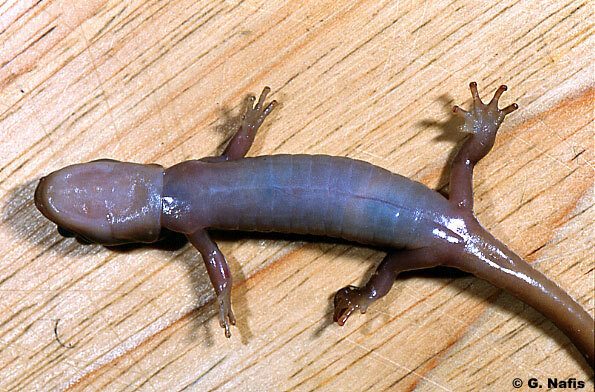 In Southern California, this salamander is also associated with sycamores along seasonal streams. Endemic to California and northern Baja California. Occurs from Humboldt county, south along the coast and coast ranges into Baja California del Norte, and in the foothills of the Sierra Nevada Mountains from El Dorado County to Madera County. Also found on several islands off the coast of California - the Farallon Islands, Año Nuevo Island, and Catalina Island, and on Los Coronados Island off the coast of Baja California del Norte. One species of A. lugubris is recognized, but several DNA studies have shown that there are genetically different groups within the species. The most recent research I am aware of is that of Sean B. Reilly et al ** in a study of the phylogeographic history of Aneides lugubris published in 2015. They found substantial genetic diversity in the species due to historical isolation of populations. Their summary of the results and their conclusions are reproduced below (emphasis mine), and a copy of one of the maps from the paper can be seen by clicking on the range map below, all permitted under a Creative Commons license. The entire paper is available online at biomedcentral.com. "Results: We found six major mitochondrial clades in A. lugubris. 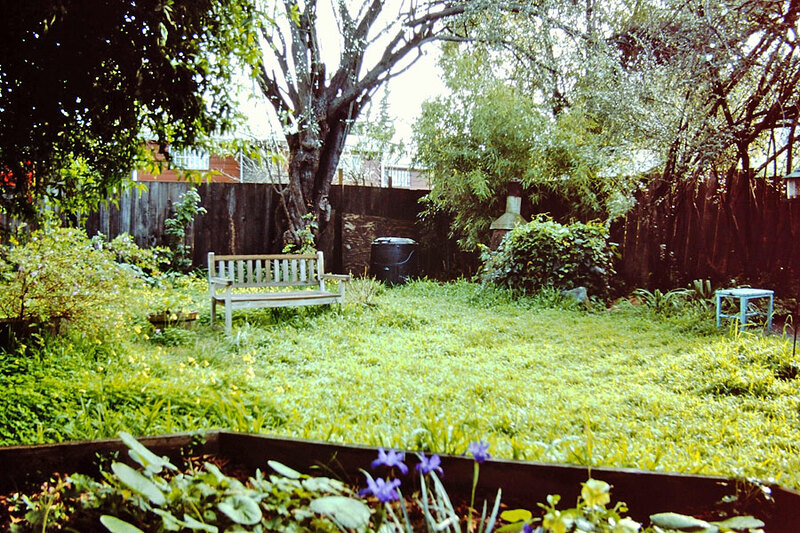 Nuclear loci supported the existence of at least three genetically distinct groups, corresponding to populations north of the San Francisco Bay and in the Sierra Nevada, in the Santa Cruz Mountains, and in the central coast and southern California. All of the genetic breaks in mitochondrial and nuclear loci corresponded to regions where historical barriers to dispersal have been observed in other species. Geologic or water barriers likely were the most important factors restricting gene flow among clades. 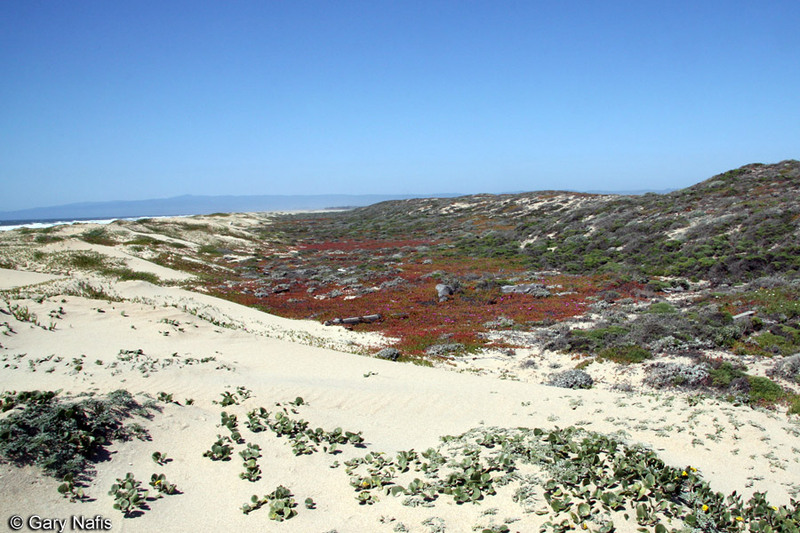 Climatic unsuitability during glacial maximum may have contributed to the isolation of the mitochondrial clades in the central coast and southern California. 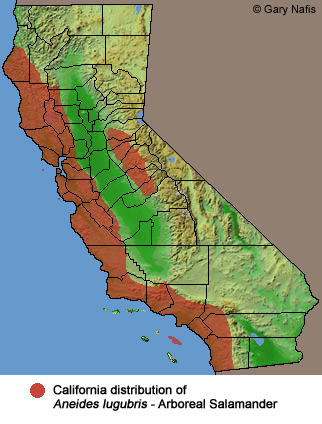 A projection of our species distribution model to a future scenario with a moderate amount of climate change suggests that most of the range of A. lugubris will remain climatically suitable, but climatic conditions in the Sierra Nevada and low elevation areas in Southern California are likely to deteriorate." Conclusions: Aneides lugubris contains substantial cryptic genetic diversity as a result of historical isolation of populations. At least two (and perhaps three) evolutionarily significant units in A. lugubris merit protection; all six mitochondrial clades should be considered as management units within the species." Below is a map I made showing my estimates of the ranges of the 6 clades of A. lugubris, extrapolated from the map included in the publication. Areas where I am in doubt which clade is present I have marked with gray. Approximate locations of the samples used on which I based the shaded portions of the map are shown as darker dots. Click on the map below to see the original map from the publication. ** Sean B. Reilly, Ammon Corl, and David B. Wake. An integrative approach to phylogeography: investigating the effects of ancient seaways, climate, and historical geology on multi-locus phylogeographic boundaries of the Arboreal Salamander (Aneides lugubris). BMC Evolutionary Biology (November 2015) 15:241. "There are two geographically segregated groups of chromosomally differentiated populations of arboreal salamanders (Sessions and Kezer, 1987). These two karyotypes intergrade in south and east-central Mendocino County (Sessions and Kezer, 1987). Unpublished genetic analyses (allozymes and mitochondrial DNA sequences) show that the chromosomal units do not correlate with patterns of genetic variation (Jackman, 1993). The Farallon Island population is most similar genetically to the nearest mainland population, not populations in the Gabilan mountains to the south as suggested by Morafka (1976; see also Jackman, 1993)." Nancy L Staub and David B. Wake. Amphibian Declines: The Conservation Status of United States Species. University of California Press, June 2005. 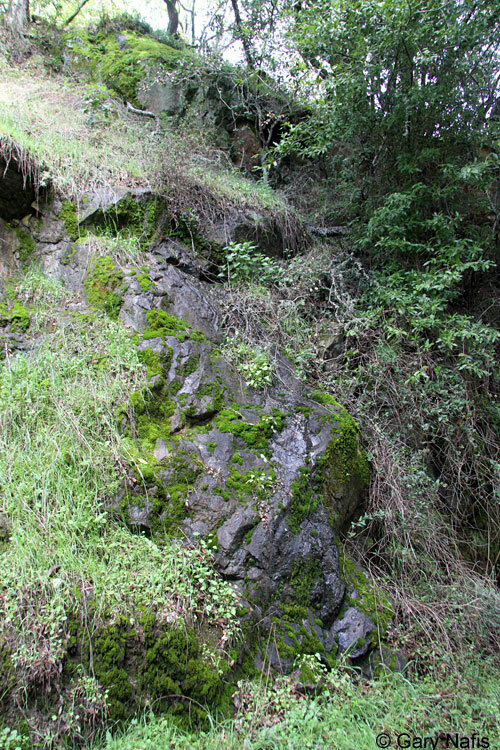 The Arboreal Salamanders on Southeast Farallon Island were recognized previously as the subspecies A. l. farallonensis - Farallon Salamander (Morafka, 1976), because they are more heavily spotted than mainland salamanders (except for those found in the Gabilan Mountains of Monterey County.) They have since been found to be similar genetically to the nearest mainland populations. Because of its reliance on oak trees for nesting and aestivation, the continuing decline of live oaks and the alteration of oak woodlands may have a negative effect on this species. lugubris: Latin - gloomy, dark, possibly referring to dull coloration. David J. Morafka. Biogeographical Implications of Pattern Variation in the Salamander Aneides lugubris. Copeia, Vol. 1976, No. 3 (Aug. 20, 1976), pp. 580-586.